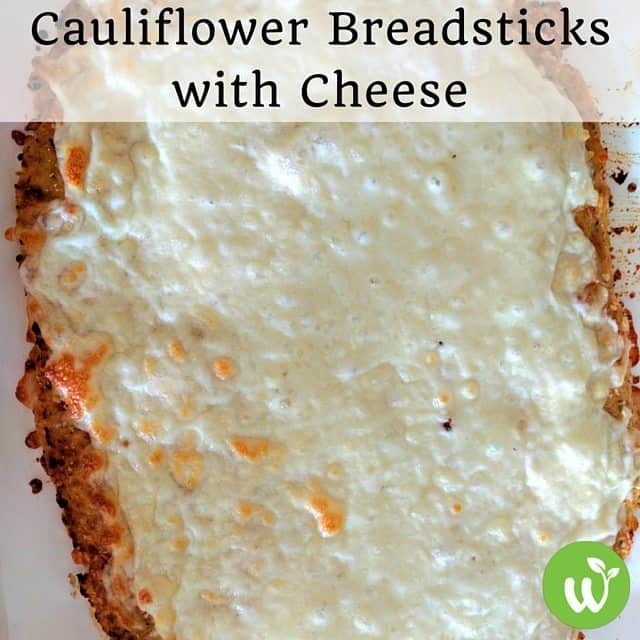 These delicious cauliflower bread-sticks have all the taste of the traditional ones without all the carbs and calories. The egg and cheese inside of the cauliflower work well to hold the crust together. It really doesn't fall apart unless you skip getting the moisture out! These breadsticks are incredibly delicious. Though, I needed a fork to eat them. This makes a pretty large batch of breadsticks. You'll need two pans. One serving is 1/4 of one pan. Chop the cauliflower into small pieces and toss into your food processor. Pulse until the cauliflower looks similar to rice (pictured). You may need to scrape down the sides of the food processor a few times. Microwave in a microwavable container with a lid for 10 minutes. Tip: I used a container that has a steam basket insert with slots in the bottom to allow extra liquid to drain off. Allow cauliflower mixture to cool for about 7 minutes. Then gather in cheesecloth (or cotton cloth) and squeeze out the extra moisture. Split the mixture in half and place 1/2 on each baking sheet. Use a spoon or spatula to form into a round/oblong shape. Bake the crust for 25-30 minutes or until nice and golden. (Without topping). Remove from oven and sprinkle with remaining cheese. Bake for another 10 minutes until cheese has melted.